"The Itsy Bitsy Drummer," a podcast written and produced by SciCom student Helen Shen '12, was selected for the inaugural edition of Science Studio—The Best Science Multimedia on the Web. Shen created her four-minute podcast as part of the Science Communication Program's multimedia course in spring 2012. It accompanies her feature story in Science Notes 2012, for which Shen interviewed UC Berkeley researchers who study the courtship dances of male jumping spiders. The podcast explores the innovative tools used by the scientists to capture the vibrations made by the spiders' bodies, including a laser vibrometer and a disk of stretched pantyhose. Shen spoke with graduate student Madeline Girard and postdoctoral researcher Patrick Kelley, who work in the laboratory of UC Berkeley behavioral ecologist Damian Elias. The Science Studio awards were created with Kickstarter funding and a grant from the National Association of Science Writers. Among the other honorees in the 2012 collection of podcasts and videos were RadioLab, NOVA, Science Friday, and NASA's Jet Propulsion Laboratory. Audio adviser for Shen's podcast was broadcast journalist Molly Bentley, a regular lecturer in the SciCom program. Bentley is executive producer of Big Picture Science, a weekly podcast and radio program from the SETI Institute in Mountain View. 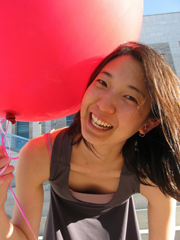 Shen earned her Ph.D. in neuroscience from UC San Francisco before joining the Science Communication Program. After graduating, she worked as a reporting intern at The Boston Globe (Kaiser Family Foundation health reporting internship) and Nature in Washington, D.C. She is now reporting and editing for ﻿Nature﻿ from her home in the San Francisco Bay Area.